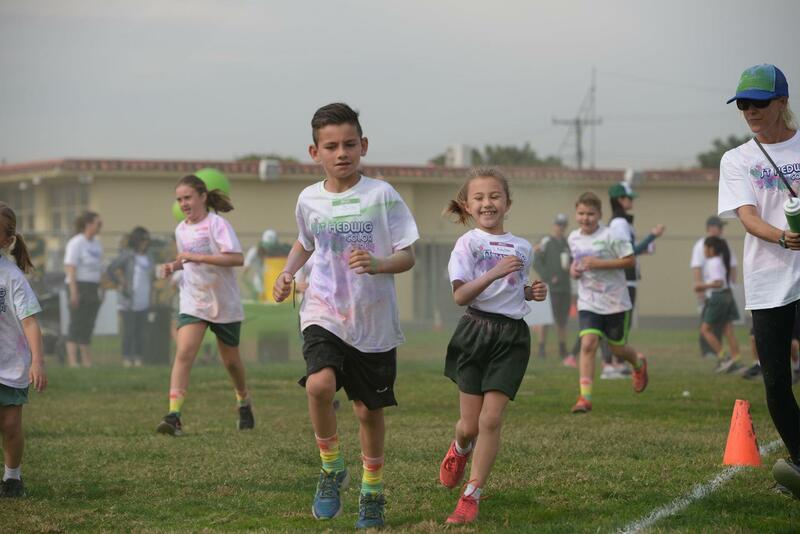 The St. Hedwig School Parent Teacher Organization's annual Jog-a-Thon fundraiser is Wednesday, Nov. 14. This year's theme is a Bubble Bolt, a unique race in which students will run through bubbles at stations along the course. This is truly a fun run. There are no winners, just lots of running, bubbles and quality time with friendship partners. 1. Encourage a healthy lifestyle for our children. 2. Raise money for the general fund to help keep tuition costs down. The Jog-a-Thon committee is hard at work to make this a fun and memorable event for all SHS students. Our goal is to raise $60,000. $350 raised for a single student, or $700 per family, earns a ticket for each student in the family to go for a limo ride to Mama's on 39 restaurant for an ice cream treat. In the weeks leading up to the event, our top three fundraisers will be announced at morning assembly and have a chance to spin the prize wheel to win a variety of gift cards or school prizes. Click here to register, send pledge requests and start earning prizes.